La Marina degli Stati Uniti ha avviato il processo per la sostituzione degli attuali F-18 Hornet assegnati alla pattuglia acrobatica dei Blue Angels con il nuovo Boeing F/A-18E Super Hornet. In una nota del 3 Dicembre la Marina ha riportato che la Boeing riceverà un contratto per lo sviluppo dell’ingegneria necessaria per apportare le dovute modifiche al Super Hornet tali da renderlo adatto al ruolo dei Blue Angels. 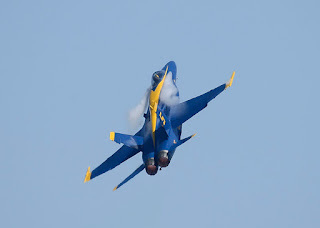 The U.S. Navy has started the process for the replacement of the F-18 Hornet assigned to the Blue Angels acrobatic team with the new Boeing F/A-18E Super Hornet. In a note of December 3, the U.S. Navy reported that Boeing will receive a contract for the development of engineering necessary to make appropriate modifications to the Super Hornet that make it suitable to the role of Blue Angels.